Donaldson Timber Engineering is one of three companies in the James Donaldson & Sons Group, a family owned business with group head office in Scotland. DTE manufactures roof trusses and engineered floor joists for the house building industry and has several manufacturing sites spread across the UK. Jonathan Fellingham, Managing Director of DTE had planned a Strategy Awayday with the DTE Board and wanted to ensure that this important time was used effectively. Jonathan thought that external facilitation would keep the team focused, on-track and help them to develop as a team. During a two-day workshop, Mark shared his thoughts on both Strategic Thinking and Team Building and led the team through a structured, strategic thinking, process, looking at a whole range of threats and opportunities to the business. During the process, the team reviewed how they were working together and discussed improvements. Myers Briggs (MBTI) was used to help the team understand the team’s interpersonal dynamics. This workshop led to a coherent strategic plan for the company that provided focus and direction. The rest of the management population was later engaged via workshops that also included management skills training. The strategic plan was followed and this saw a new site open in Warrington, the introduction of new products and services as well as the implementation of new IT systems. Both revenue and profitability increased. More recently it became apparent that the house building market was changing, potentially moving more towards complete offsite solutions. 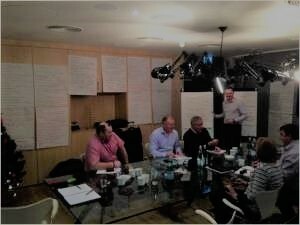 Mark facilitated a further strategic planning workshop in the light of changes to the business environment. A similar process was followed but with new threats and opportunities to be identified. Scott Cairns, the Group Managing Director, participated in this second workshop to see what Donaldson Timber Engineering were doing and how their strategic thinking process worked. A revised strategy evolved, including forging partnerships with customers and other suppliers and bringing the manufacture of a previously outsourced product in-house. The management team committed to more regular reviews of their strategic plan to keep ahead of the changing business environment. As a result of what he saw, Scott was instrumental in enabling Mark to then follow a similar process with both of the other group companies, James Donaldson Timber (JDT) and MGM Timber (photo). All three companies are now implementing their agreed strategies.